From the Mixed-Up Files of Mrs. 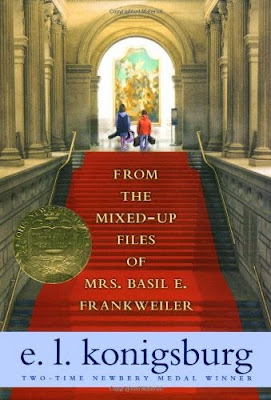 Basil E. Frankweiler is the last book I read for literature in fourth grade. This book is about a girl named Claudia and her brother Jamie who run away from home to teach their parents a lesson. They run away to the Metropolitan Museum of Art. Everyday, they would sneak past the guards and sometimes almost get caught. In the museum, Claudia finds a really pretty statue called Angel and won't go home until she finds out who made the statue. Eventually, Jamie is running out of money and they have to go home, but Claudia convinces Jamie to go to Mrs. Basil E. Frankweiler's house, the previous owner of Angel. When they get to her house, they find out she has file on a statue! If they can find the file in an hour, they can find out the answers. I liked this book because it takes place in a real museum, not a made up location. My favorite part of the book was when Claudia and Jamie bathed in the fountain and found a bunch of money. I also like how the author explains the feeling the kids were having, like how Jamie felt sad and homesick when his class came to the museum.